A single roof leak in your home can cause irreparable damage if left unchecked. Know how to fix a leaking roof and how to regularly inspect for roof leaks can be incredibly beneficial in saving your home from extended damage. It’s important that you know what to look for when trying to identify a leaky roof. When you know the warning signs you should have no trouble not only identifying that your roof is in fact leaking, but also pinpointing the general area of the leak. If you see any brown, gray or yellow stains on the surfaces of your home, these are typically caused by water damage. Look out for the stains on the walls and ceiling sections of your home. If you spot a stain in one of these areas, you should immediately start looking for the cause of the leak in the area. The sooner you spot the reason the roof is leaking, the sooner it can be repaired. 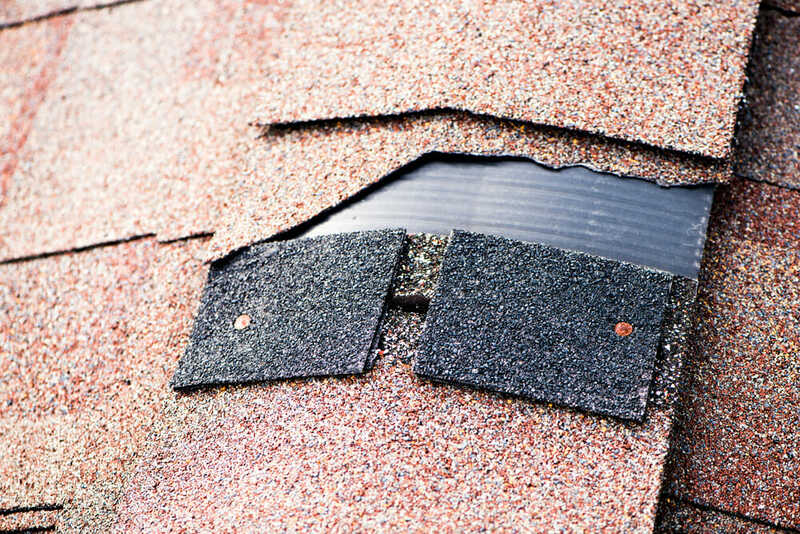 If you see any shingles that are cracked or broken, curling up away from the roof, or missing, that is a problem. These are sections that can and will allow water into your home. Visually inspect the roof of your home regularly for these problems and you can resolve them before they lead to water getting into your home. 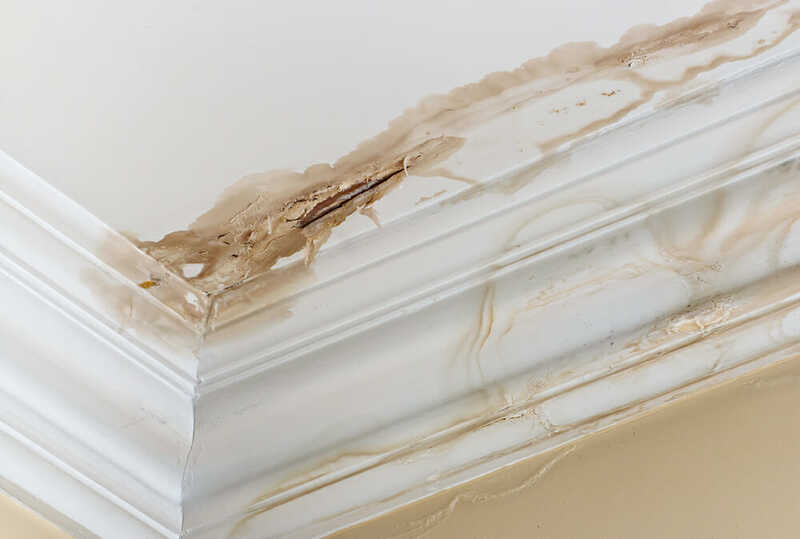 If you notice mold forming on sections in your home near the roof there is a good chance you’re suffering from a minor leak—major leaks are most often accompanied by water stains. If there are no water stains but clearly some mold in a section of the roof, moisture is getting through enough to keep things damp, but not enough to really cause staining. Look outside your home near the spot you saw the mold for obvious signs of a leak. On a flat roof, the most common sign of a leak is blistering or wrinkling. You’ll notice serious creases or curled and wrinkled sections on your roof. These are signs that water is getting in under some of the layers of the roofing and then heating up and expanding. The issue has to be resolved fast or water will make it all the way through your roofing. Check out your attic regularly to see if it’s developing a moldy or damp smell. While this could simply mean that you don’t have enough ventilation in the space, it is also a sign of a leaky roof that’s allowing moisture in. You’ll likely notice damp and spongy plywood around the site of a leak, and possibly water stains. There are common reasons that a roof leak can occur. Learning these reasons and understanding how to fix the cause of the roof leak in each of these positions is the best way to solve a leaky roof fast and get it back to where it is watertight once again. 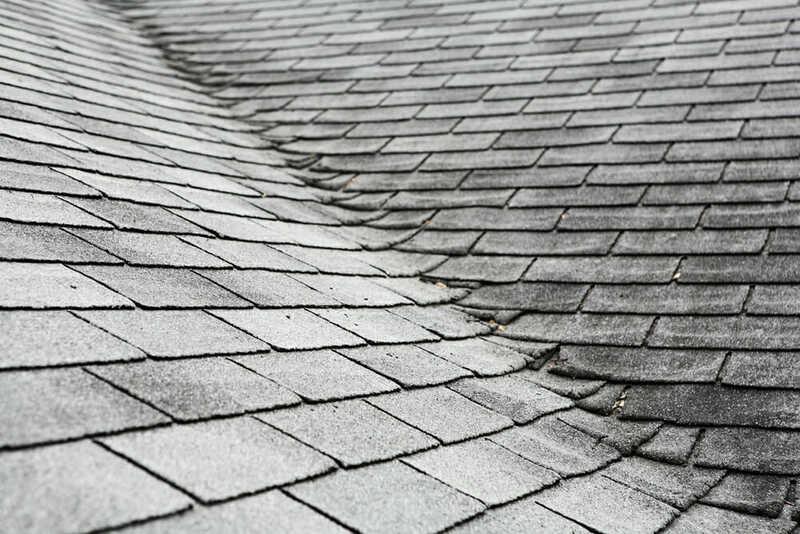 One of the most common causes of roof leaks on an asphalt shingle roof are from shingles that blew off the roof. This could be because they weren’t secured properly or due to strong winds. Fortunately, repairing missing shingles is straightforward. Tap down all the existing nails so that they are out of the way. Pull out the nails from all the shingles above the row of missing shingles at least one shingle to the side of the section on either side. Now pull out the nails from two rows above the opening. With the nails removed you can now slip the replacement shingles into place and nail them down by lifting the next shingle row up and nailing underneath the shingles below the tar strip. Finish your fix by replacing all the nails that you removed on the undamaged shingles. You shouldn’t have a roof leak through that section of your roof any longer. On metal roofing the major weak point of the roof is at each of the fasteners screwed in place to hold it down. While the fasteners are added at the upper portion of the folds of the roof to keep them away from sections where water would flow and pool generally, they still allow water in if they wear away or begin to come up and stop holding tight. The best way to fix worn out fasteners is to replace them with a longer and more durable product, preferably one with a larger rubber washer. The fasteners with a larger washer provide more comprehensive protection and can fill in old screw holes if you have to fasten the panel in a spot that’s slight over from the original hole. Many times your roof will leak because the shingles installed on your home aren’t adhering properly. The little tar strips on all the shingles are designed to serve as glue to hold the shingles together. If the shingles were installed in cold weather they may not have ever adhered. The simple fix to this problem is to apply a layer of roofing cement underneath the shingles where they seem to be lifting up. Do this on a warm day so the cement comes out easily, and be sure to press the shingles down into place after applying the cement. After a few days you should see that the shingles are no longer lifting up like they were. Drains and vents are typically sealed using a rubber boot on your roof. Rubber does not last forever, and most of the time when you notice a roof leak beginning to develop in this area of your home you simply have to replace that rubber boot. To do this, inspect the boot for signs of a tear or cracking. If there is an obvious problem purchase a new boot designed to fit the diameter of the pipe or vent. Lift up the roofing around the boot and pull out all the nails holding the flashing in place. Slip the boot up and out of the way and slip the new one down. Be careful to slip the flashing surrounding the boot back into place properly, or new leaks will occur. The flashing should be under the roofing around its sides, and on top of the roofing at its bottom to let water flow freely. This application only works properly on shingle roofing though, and you’ll have to secure the boot in a different manner on panel roofing. Instead of putting the flashing underneath the roofing, you simply lay it down flat against the roofing and seal underneath it heavily using roofing caulk. After it’s sealed you screw it in place with screws that have rubber gaskets to keep water out. This installation method isn’t quite as durable and will need retouching more often, but it’s necessary with larger sections of roofing. Leaking around a skylight, especially an older one is very common. To fix the leaky roof you typically have to remove all the waterproofing and the layer of shingles over top of the edges of the skylight so that you can waterproof it properly. Cut off the shingles, the flashing, and anything else that’s covering up the skylight and the area 6″ around the skylight. With the section cleared all the way down to the OSB decking it’s time to get started waterproofing your skylight. Install an ice and water barrier up to the nailing flange of the skylight along the bottom, with the barrier going underneath the row of shingles just below, but over the next row of shingles down so water can run down the ice and water shield and back over top of the shingles once again. Install the barrier along the sides, making sure that it runs under the shingles and over top of the bottom row of the barrier. Finally, run the top row of the barrier up to the flange so that it covers the sides and runs underneath the row of shingles up above. This creates an effective water barrier for the skylight. To make the skylight even more water resistant, install step flashing along the side edges of the skylight in between the rows of the new shingles that you install. Top the skylight with a wide piece of metal flashing that comes out over top of the nailing flange and the ice and water barrier, and top that with new shingles to complete your waterproofing. Your skylight will no longer leak. Chimneys are a common problem area for a water roof leak. The most common sections of a chimney that lead to a roof leak is the cricket, and the counter flashing. The cricket is a small peaked section on the chimney’s high side designed to divert water around it. The cricket should be sealed into the grout of the chimney itself firmly. If it has come off, reapply it using a waterproof roofing sealant. Finally there is the counter flashing. This is installed at the sides and base of the chimney. It’s the vertical portion of the flashing designed to keep water from running down and underneath the chimney. Counter flashing should also be sealed right into the mortar of the chimney. You can use roofing sealant or mortar to lock the flashing back in place if it slipped off.